Its been almost a week. Its almost been a week since we last discussed mapquest mapping. (read: Mapping Talk ’09, Jan). Unanimously it appears people outside the group of indians that work on mapquest do not like mapquest. 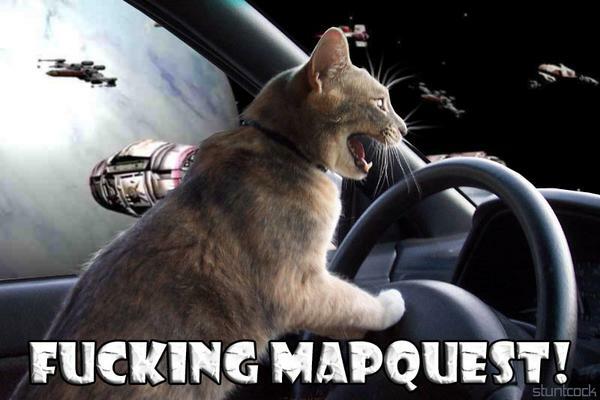 It appears cats over at third-cousin-maybe-sister site Cats.com have been having issues with mapquest mapping. I used to live there – I swear this is not photoshopped. These are all real mapquest users in Seattle…. the innocent cars they are slamming into are probably using Google Maps. No question about it. chineesee eyes, did you know its the chinese new year?